The F5 Tradition will be a limited production instrument with a retail of $12,550.00. Tom Ellis of Ellis Mandolins builds one-of-a-kind, hand made mandolins in Austin, Texas. With a master’s touch and an artist eye for detail, Tom uses his 35 years of experience in instrument building to create heirloom quality works of art. He has spent a great deal of time studying every aspect of the mandolin. It has only been through this research that he has been able to acquire the best materials and crafts people to help with the process. 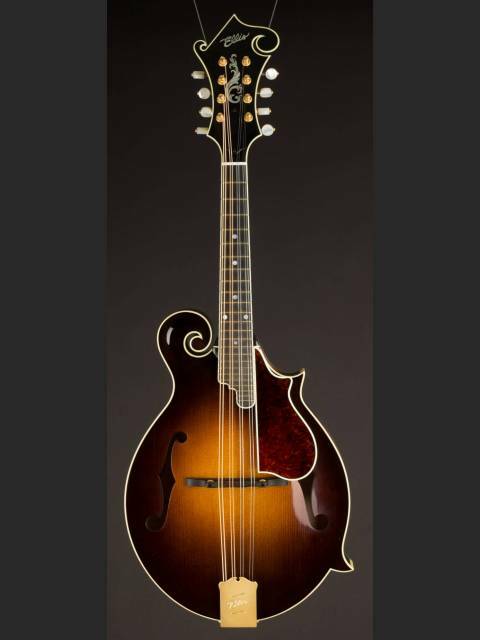 Ellis mandolins are built one at a time. Furthermore, Tom personally does all the hand carving, graduating, neck shaping and final setup. In modern times, it could be done differently. However, Tom insists on quality his customers can be proud of for generations to come. OK, IBMA attendees, we need a full report on these. I look forward to hearing in-person impressions and thoughts! Tom has only added fuel to my dreams. If I'm ever in a position to order one, I'd ask for it without the pickguard that I feel obscures too much beautiful mandolin. I have an Ellis F5 that Tom built for me three years ago and it is fantastic ! If you ever have the chance, visit Tom at his business ! Make a reservation first ! Also, ask Tom to show you his photography work as he is an excellent photographer ! Oh no!!! I have not had MAS for a very long time but that one visually speaks to me! I can’t wait to hear how it sounds! I have to say, Ellis might be my favorite builder. His mandolins are just so beautiful, and the sound is exactly what I desire in a mandolin. Went to Carter Vintage last week just to look. Went back the next day and bought an Ellis two point that had captured me. Hi Ron. I would agree with that about no pick guard but I'd also say to have a shorter fingerboard extension. I just don't get this 'keeping with tradition' and making fingerboard extensions like a Loar when most players don't like them at all. Scoop or better still short is great and if any traditionalists feel it is 'not right' then so what. Make it for the majority of players who dislike extensions. I was all set to buy a Gibson F5L recently at Tamco in Ukand went down but the fingerboard extension giving pick click was so annoying that I didn't buy it. I could have scooped it myself I suppose but it is a long extension and a long scoop looks awful. The Ellis pickguard is held in with pins. It is easily removed with a little wiggle and pull. I think I got that one Jimmy, I love it, you pretty soon forget about the extension after playing it for a while. For the record it was imported into the UK brand new in 1990, I bought it 3 months ago, I'm the second owner, it came to me in virtually unplayed condition. BTW thanks to Ivan Kelsall for the head up. Hi Dave. Yes I think Ivan told me afterwards that you got it. To be honest I was sitting there with it in my hands saying YEs/NO YES/No and decided to walk away. I have a Northfield BigMonF5 and think it is possibly the best one which ever came out of their factory but for years I had wanted a Gibson F5L or A5L and had advertised on Cafe etc for one. I check Tamco every day and jumped when I saw it. Trevor agreed to hold it for three days and I went down. My wife Carol was saying 'go and get it (lovely eh!) but in the end as you know, I didn't. I've had 7 F4s and I suppose I've got used to the extension on them but some days I regret not buying that mandolin. Looked fabulous. Just because I'm on the Ellis bandwagon at the moment, there are two of these in the classifieds right now! Andy over at Music Emporium was nice enough to share high resolution photos for the Ellis Archive, that are definitely drool worthy.